The gray modifier adds gray hairs to the entire body of the horse as it ages. 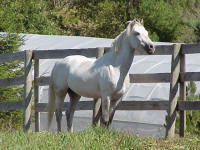 Grays are born any other color, then gradually turn white over time. 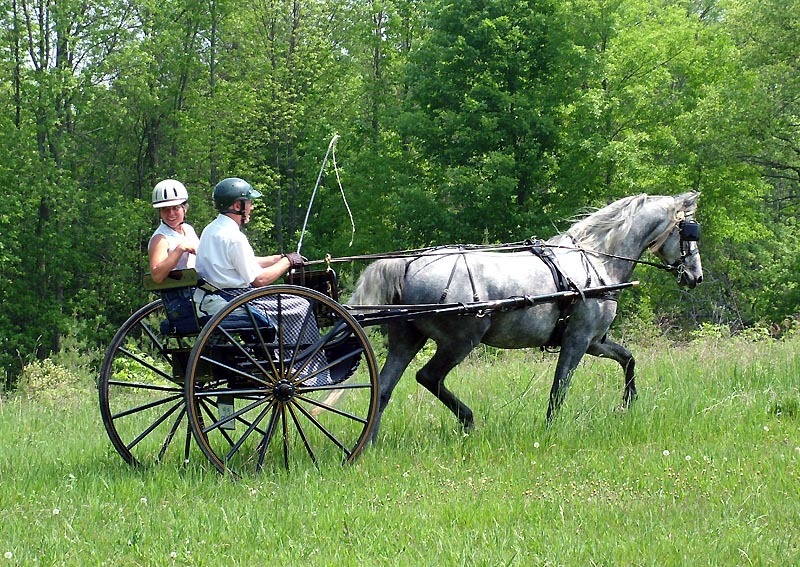 Usually, the graying process begins on the horse's head. 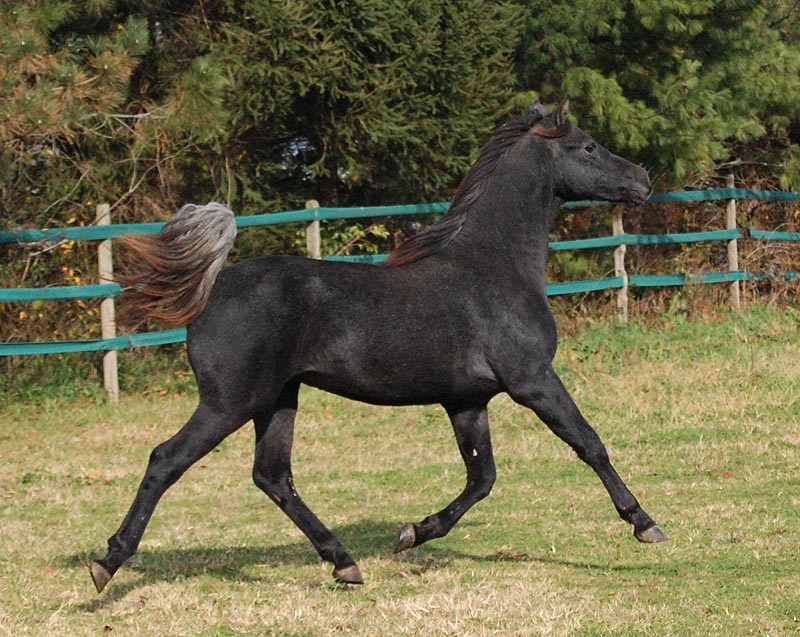 Gray foals are often very dark—darker than a non-gray foal of the same color would be. They may have lighter hairs around the eyes (called goggles) and muzzle, giving a further clue that they will eventually gray. 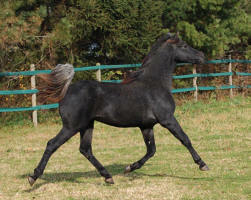 Often they go through a roany stage along the way, when they are sometimes mistaken for roans. 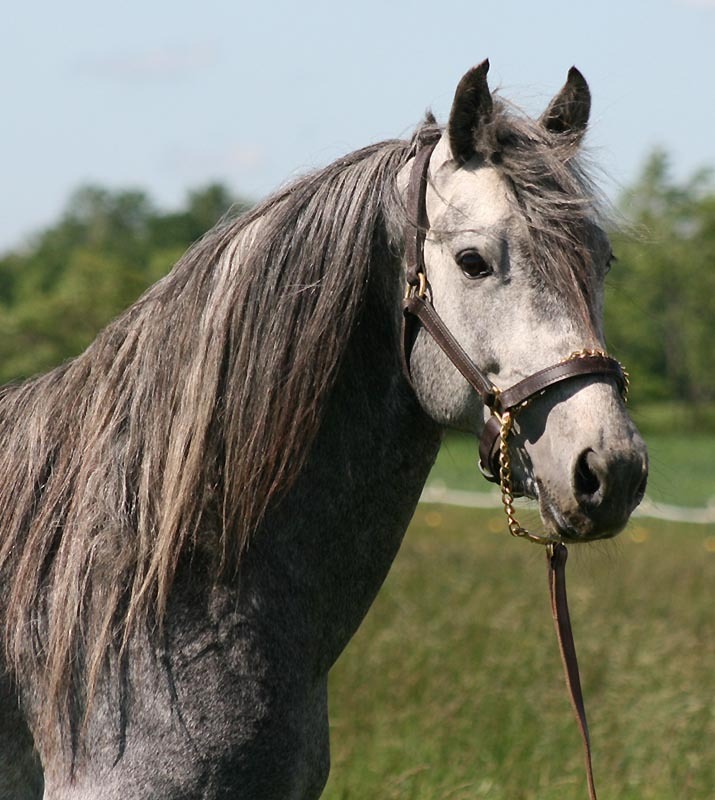 Most grays go through a very attractive dappled phase as they gray out, and some retain some pigment in the form of “flea bites”- small freckles of base-colored hair all over their head and body. 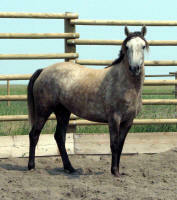 Occasionally, roaned, round white spots appear on grays. 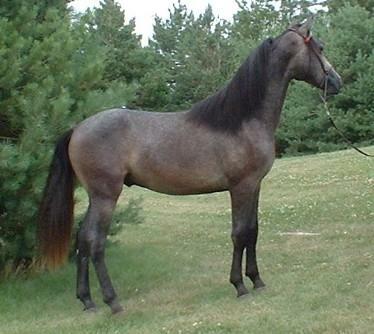 These are called chubari, or Tetrarch spots after a famous gray racehorse that had them. They disappear as the horse continues to gray out. Most grays will be completely or nearly white by age ten. 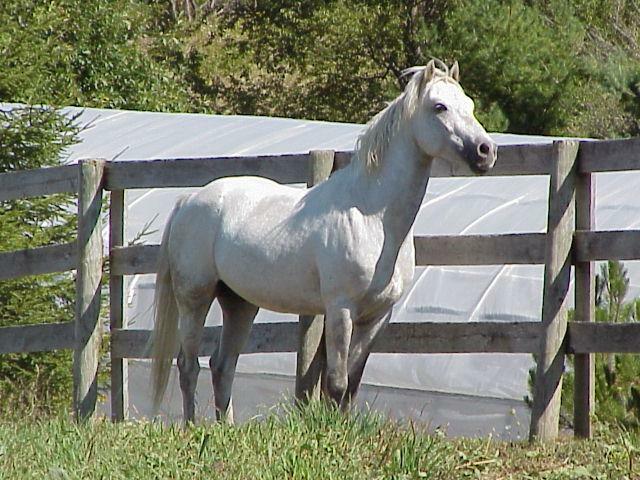 Homozygous grays go gray faster than their heterozygous gray counterparts. 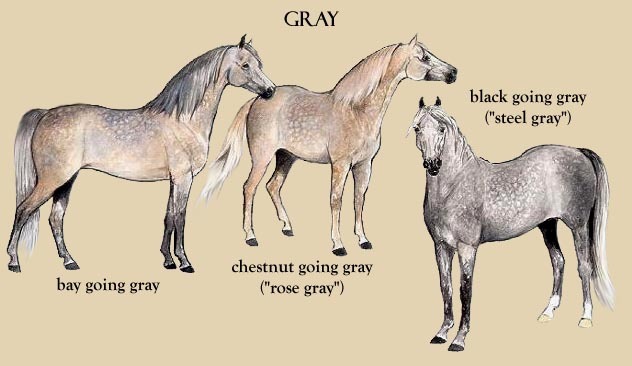 Because gray is dominant, all grays will have at least one gray parent. 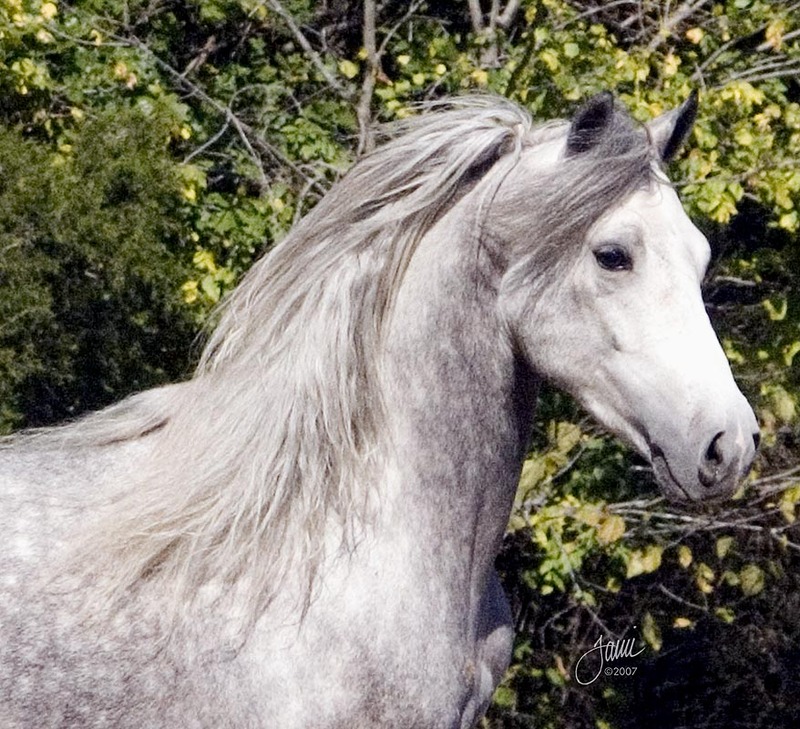 There are two sources for gray in the Morgan breed. 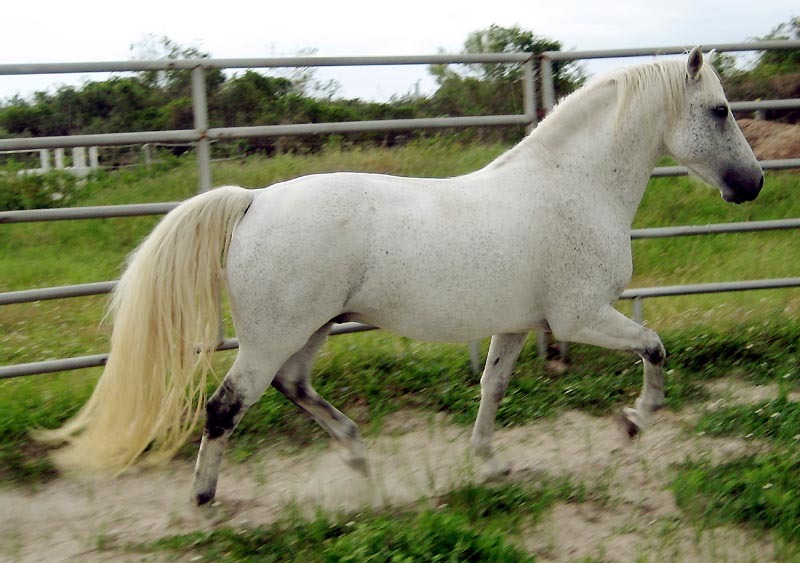 The largest descends from the 1969 gray mare Hy Crest Satina (Hy Crest Koko X Lady Satin, an X-registered gray mare and the source of Satina's color). 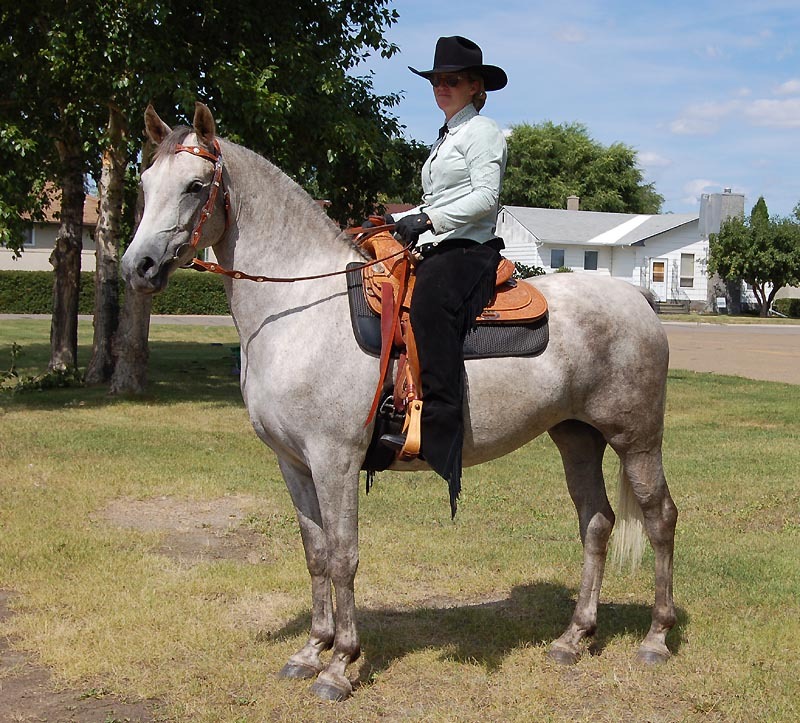 The other, more rare line is descended from the 1925 gray mare Toy (Troubadour of Willowmoor X Rachel, gray) and is represented by the 1983 mare Miss Frosty Shadow, her daughter, Silvershoe Sun Frost, and Frosty's 2005 and 2010 gray daughters Willow Bend Shadow and Willow Bend Clair de Lune. There is also a 2006 gray son of Miss Frosty Shadow, as yet unregistered. JAX IRON MAN (Rosedust Steppin Wolf, brown x JAX Splenda, gray) 2012 black-based gray gelding owned by Suzy Trueblood. Iron Man was very light from a young age. 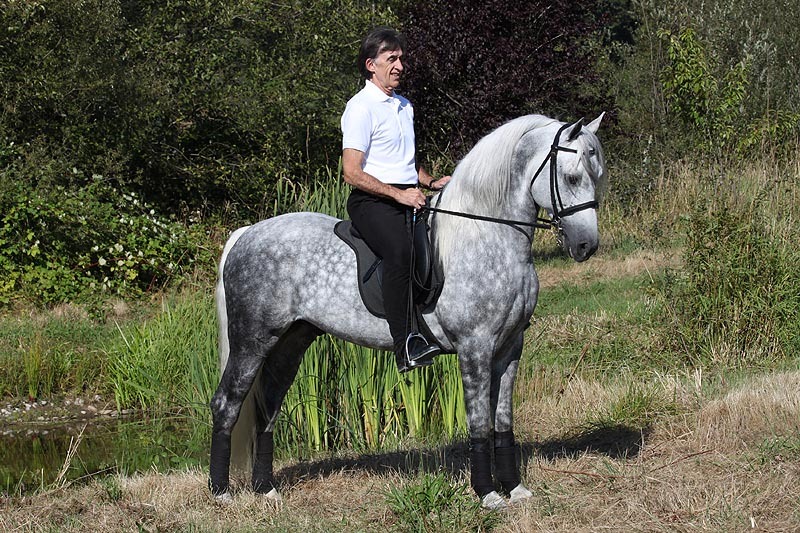 Though this is not unusual with homozygous grays, he is heterozygous. The adult picture shows him at age three in 2015. First photo courtesy of Society Training Stables. Second photo by Shiflet. 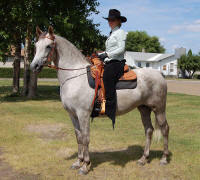 FFCF SWASHBUCKLER (CWs Totally Silver x FFCF Jamaca Me Crazy) 2007 bay based gray gelding owned by Allen Tucci. 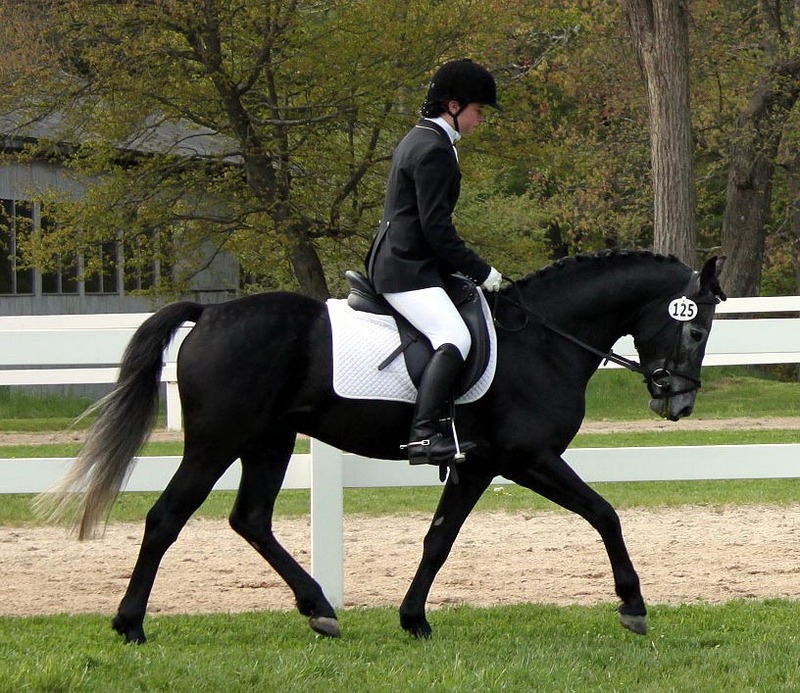 Shown here in the Tucci four in hand at the 2014 Devon Horse Show. Photo by Suzy Lucine. WINTER MOON PHENOMENON (Winter Moon Enlightenment x Dream Acres Sweet Caroline), 2003 gray gelding, pictured as a yearling on the left, as a 4 year old in the middle, and as a 9 year old on the right. Owned by Marla Stuermann. 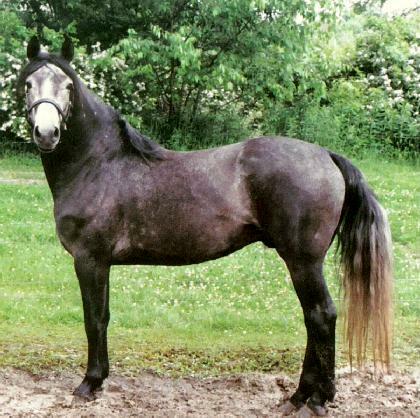 This colt was born bay; the interesting steel gray color he was as a youngster has gotten lighter, going through a dappled stage as you can see in his 4 year old picture, and he is lightly flea bitten as a 9 year old. First two photos courtesy of Tami Johnson; third photo courtesy of Kris Breyer. CW'S SILVER DOLLAR (CW's Sterling Silver x Tonya), 1994 gray gelding owned by Carrie Hazel, Hazel Run Morgans. 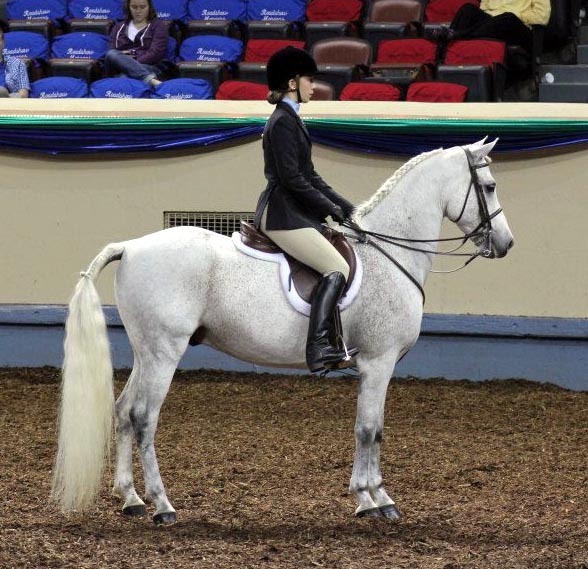 SILVERSTONE MISTY DAWN (CW's Silver Ash x FCF Carissima), 2003 gray mare owned by Marilyn Esteb, Stone Pine Farm. Emmy Seder up. 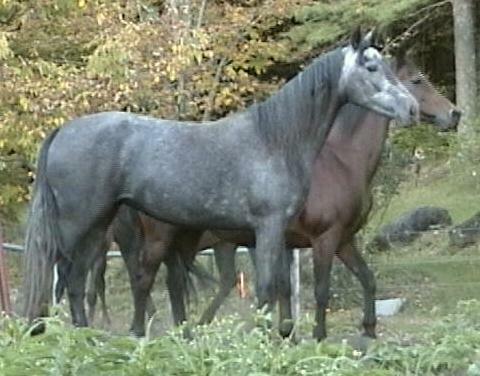 WINDRIDGE SILVER BULLET (Noakes Buckshot x Beacon Silver Dawn), 2008 gray (black based) stallion owned and ridden by Carly Collari. 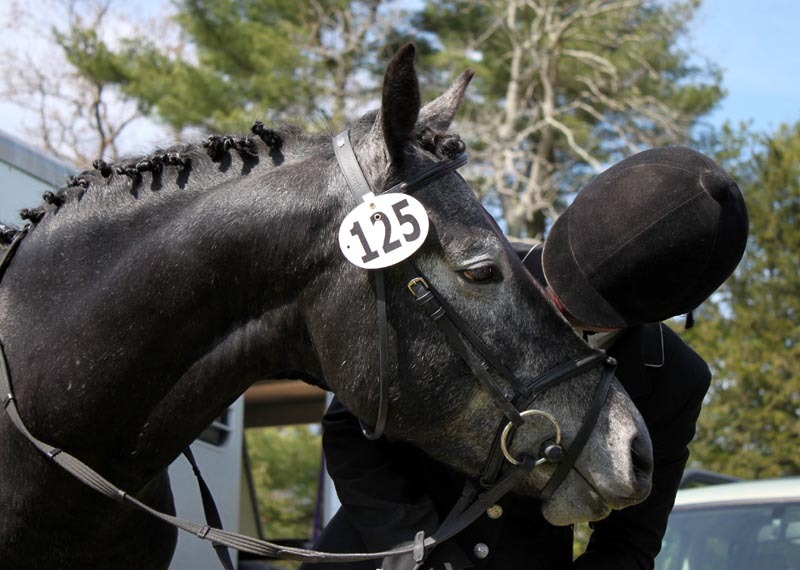 Pictured at age 4 at his first show, May 2012. You can see in the headshot how grays begin the graying process on the head, around the eyes and muzzle, with gray hairs beginning to come in on the neck and body. FIRECREST SANTA FE (Winter Moon Enlightenment x Amigo Alexis), 2001 gray stallion, owned by Steven Finch and trained by WW Training. Shown at left doing a freestyle demonstration with Joe Wiggins, and on the right with Steve Finch up. 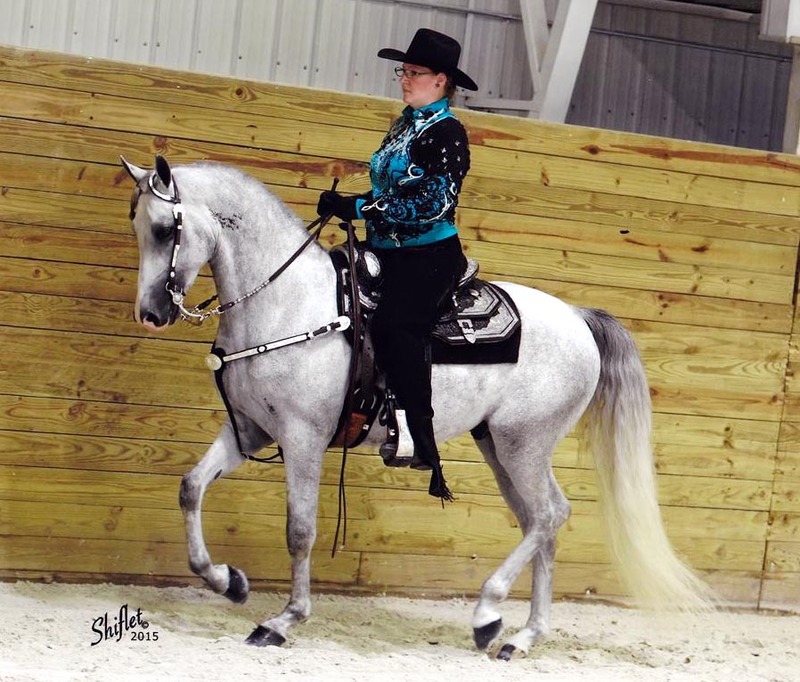 RDK'S KNIGHT HAWK (Winter Moon Enlightenment x Blacksaddle Jasmine) 2003 gray stallion owned by Erica Parker, Stone Temple Farms. Photo courtesy of Carla Resh. SNR STEEL BLUE MAGNOLIAS (Winter Moon Enlightenment x Gay's Blue Velvet), 2000 gray stallion, with Meredith Rosier up at the 2008 Morgan Grand National. Photo by Debbie Uecker-Keough. 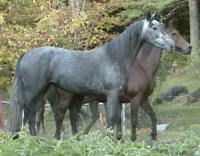 WILLOW BEND SHADOW (Double Black Knockout x Silvershoe Sunfrost), 2005 gray mare. Photo courtesy of Ellen Feld. JAX PLATINUM PLUS (Rio's Reflection x JAX Splenda), 2010 gray gelding, pictured as a yearling. Owned by Al & Sallyann Gerelli. Photos courtesy of Trisha Hess. AMBERFIELDS STEEL MAGNUM (SNR Steel Blue Magnolias x FPS Lily's Fayre Alabaster) 2008 gray (homozygous) stallion owned by Judy Hinman, Amberfields Morgans. FPS FROSTED CREME BRULEE (Fayre Owen x Amberfields Carmel Mist) 2006 gray mare. 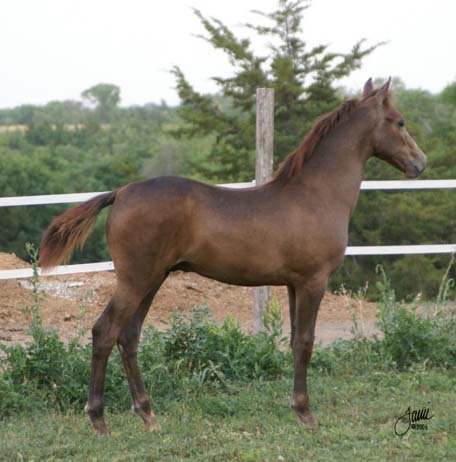 This mare has a sooty palomino base coat, though when this picture was taken (as a 3 year old) not much evidence of it remains. Photo by Marilyn Vander Wekken. 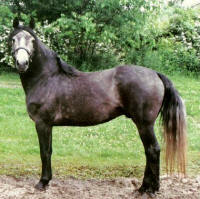 HEARTH'S MERCURY RISING (SNR Steel Blue Magnolias x Saralin's Endearment), 2004 gray gelding owned by Spence Dickinson. Photo courtesy of Tori Wilfred. TFM SKYWALKER (CW's Silver Dollar x KMS Cover Girl) 2000 gray stallion owned by Bob and Marge Thomas, TFM Morgans. BNWD MOONLIGHT SILHOUETTE (Winter Moon Enlightenment x Bluevue Silhouette) 2003 gray stallion owned by Vickie Davis, Benwood Morgans. "Moon" is shown here at the "flea bitten" stage of going gray. 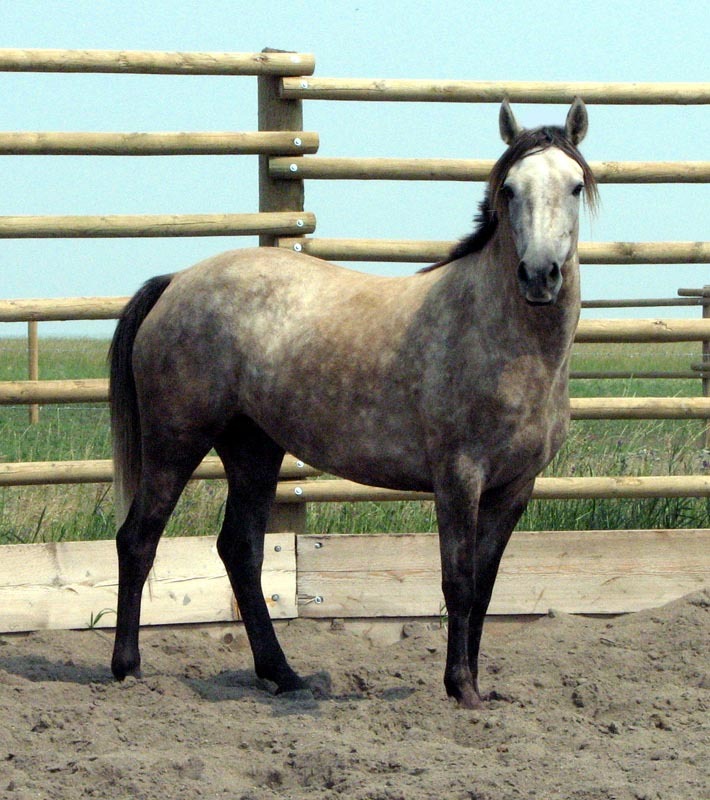 SILVERSTONE FIREFLY ASH (CW's Silver Ash X Triple S Firefly), 2004 gray mare owned by Coulee Bend Morgans, Lyle and Cindy Dietz, Galahad, AB. This photo was taken in August 2008 at Ash's first show. To our knowledge this was the first time the first time a gray Morgan has been shown in Western Canada. 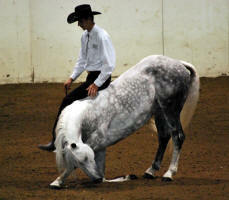 Ash placed 3rd in a big snaffle bit class and 3rd in another big Jr Horse Western Pleasure class. She was the only non-Quarter Horse to place in these performance classes. FFCF ALABASTER SHORES (CW's Totally Silver x Atta Lane Attie), 2006 gray filly owned by Kathy Flanagan. Shown here with Kathy. Photo by Dianne Justa. 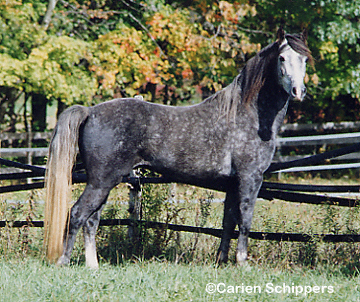 CW'S SILVER ASH (Hillside Stoney Ash X HyCrest Satina), 1993 gray stallion owned by Anne Boorman. Ash shows heavy fleabiting, which is a feature on some grays. 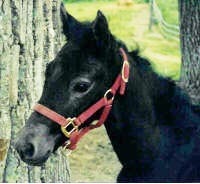 WINTER MOON HAIKU (Shanghai X Winter Moon Light Kisses), 2006 gray gelding, pictured as a weanling. Gray foals are always born some other color and then "go gray" over time. You can see the faint tinge of pink caused by the interspersed gray hairs already starting to emerge on this chestnut based weanling. Photo by Tami Johnson. Owned by Tammy Drumbore. 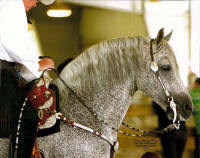 WINTER MOON LIGHT KISSES (Winter Moon Enlightenment X B-L Bella Donna), 2001 gray mare owned by Jeanne Masters, Winter Moon Morgans, Seward NE. Photo by Tami Johnson. 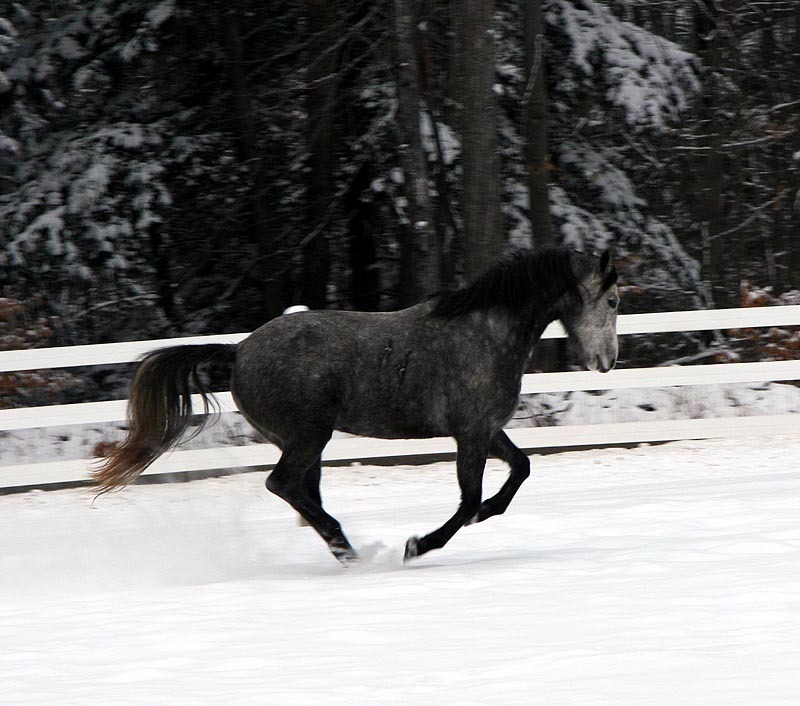 SILVERSHOE SUN FROST (Silvershoe Sun Dust X Miss Frosty Shadow), 2001 gray mare owned by Ellen Feld of MA. 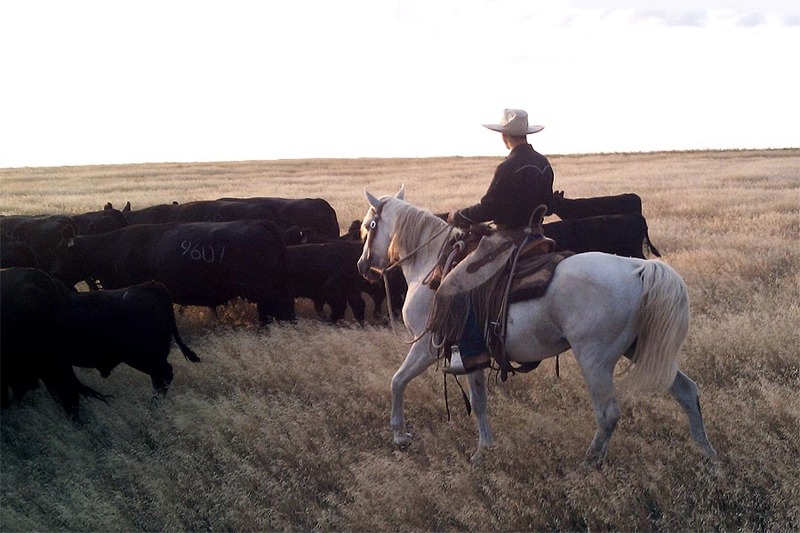 This mare, her 2005 gray daughter Willow Bend Shadow, and 2010 gray daughter Willow Bend Claire de Lune are the last remaining descendants of the Saycrest Frosty Miss line of grays. Photo courtesy of Erin White. SC ISLAND SILVERADO (CW's Sterling Silver X Gremarbin Arabesque), 2000 gray stallion owned by Helga Loncosky and Sherry Siebanaler. 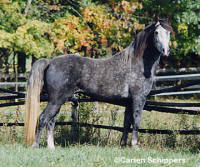 CW'S STERLING SILVER (Todita X Hy Crest Satina), 1990 gray stallion owned by Carol Guay of Dryden Michigan. CW'S SPECIALEDITIONSILVER (CW's Silver Ash X CW's Silver Coin), 2000 gray stallion. 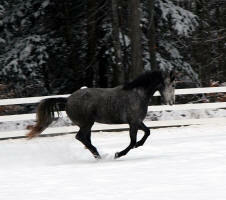 This stallion may be homozygous for gray; both parents are gray and so far all of his foals have been gray as well. 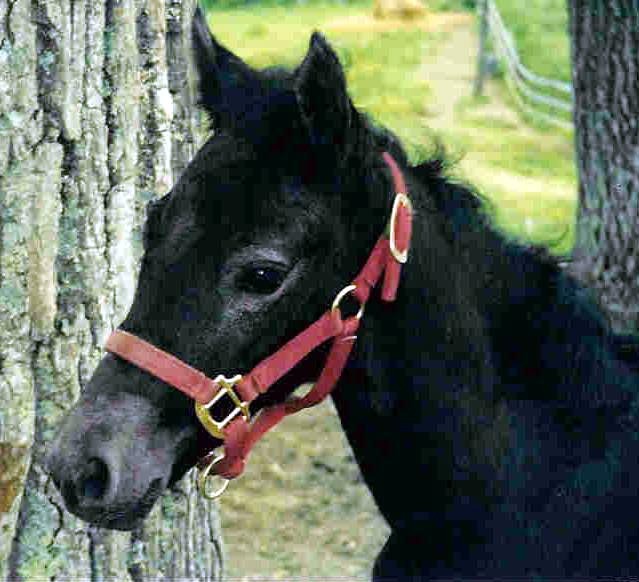 Homozygous grays are thought to go gray faster than heterozygous grays, which would account for why he is almost completely gray at just four years of age, when this picture was taken. Photo courtesy of Roxanne Riggs. 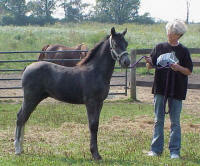 CW'S SILVER JET (CW's Specialedition Silver X CW's Silver Sundae), 2004 gray stallion (pictured as a weanling) with his breeder Carol Guay. Now owned by Walter and Janet Brown. CW'S SILVERWOOD (CW's Silver Dollar X Del View Heidi), 1999 gray stallion, owned by Celeste Brown. You can see more of "Woody" here. Photo by Carien Schippers. 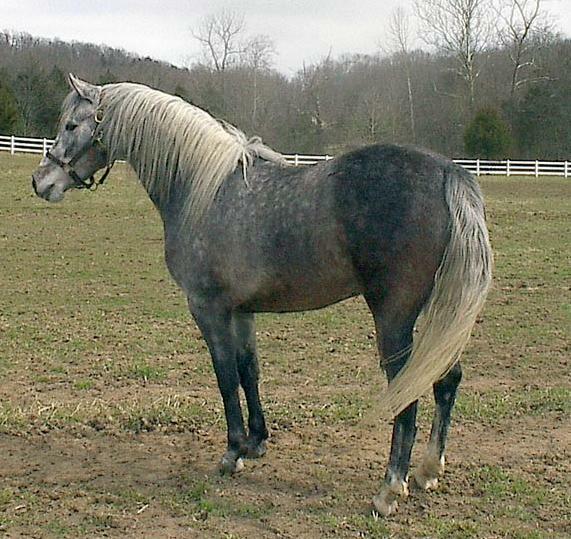 SILVERSTONE NOBLE ASH (CW's Silver Ash X Nemours Noblelea), 2004 gray mare (pictured as a foal) owned by Ann Coe. 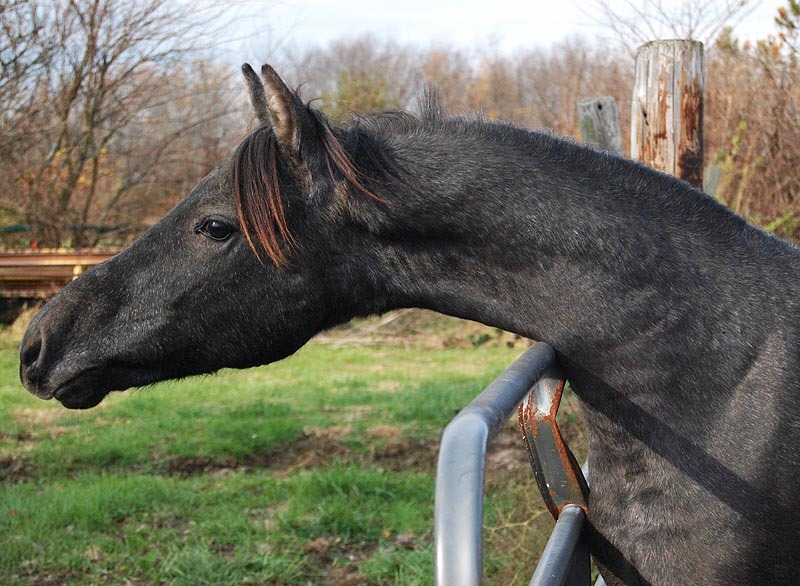 Born black, the gray hairs around her eyes and muzzle are a clue that this filly will indeed go gray as she ages. 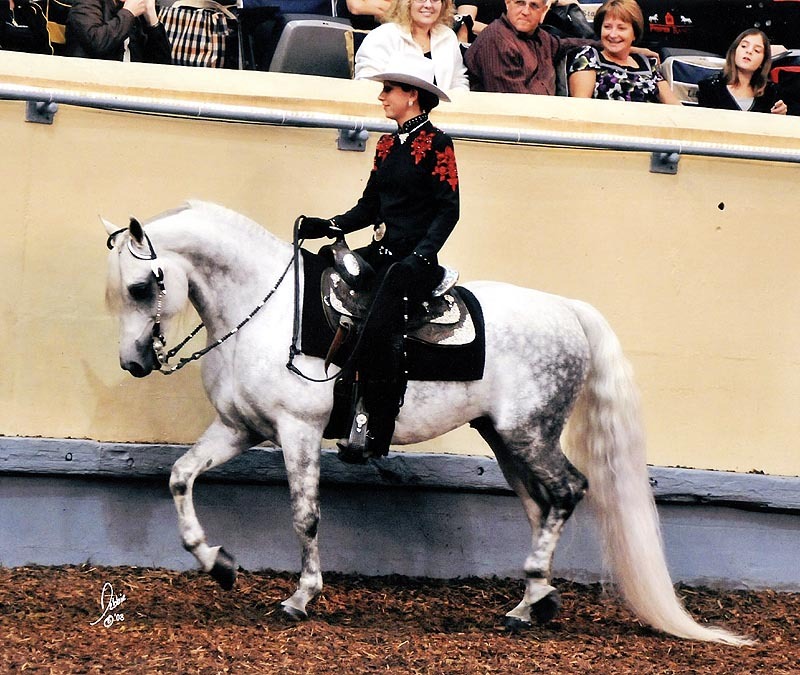 WINTER MOON ENLIGHTENMENT (CW's Sterling Silver X Season's Ebony Lark), 1995 gray stallion owned by Jeanne Masters, Seward NE.